February 28, 2018 - Frostpunk is nearing its final launch date announcement with the release of a brand new development video, “Irreversible”. Accompanying the new video asset is its launch price of $29.99 USD and brand new, stunning box art. How would you rule a world that seemed beyond hope? How would you pull your people together when society’s very survival was at stake? Would it be with a gentle nudge, or a firm hand? Machiavelli, a noted Renaissance politician once posited, “Since it is difficult to join them together, it is safer to be feared than to be loved when one of the two must be lacking”. 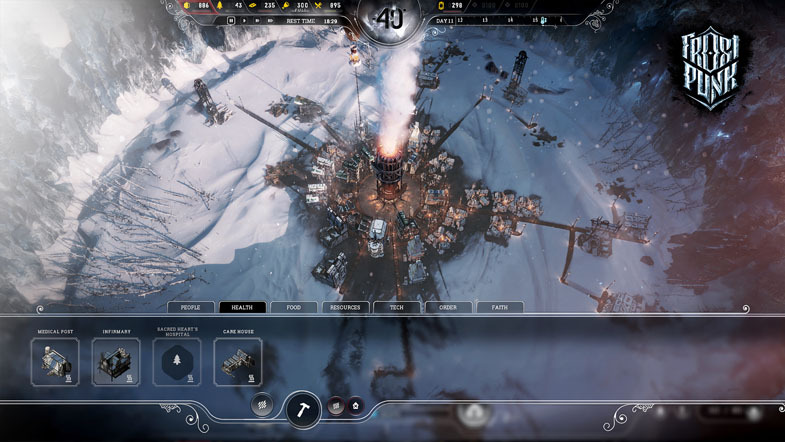 Frostpunk developers tackle these questions head-on in their new developer update, ‘Irreversible’,highlighting all-new gameplay features all about ruling over your frostbitten constituents. Perhaps these questions hit a little closer than we’d like. We live in a world where being ruled through fear is a harsh reality for many, something we often see when we turn on the news. 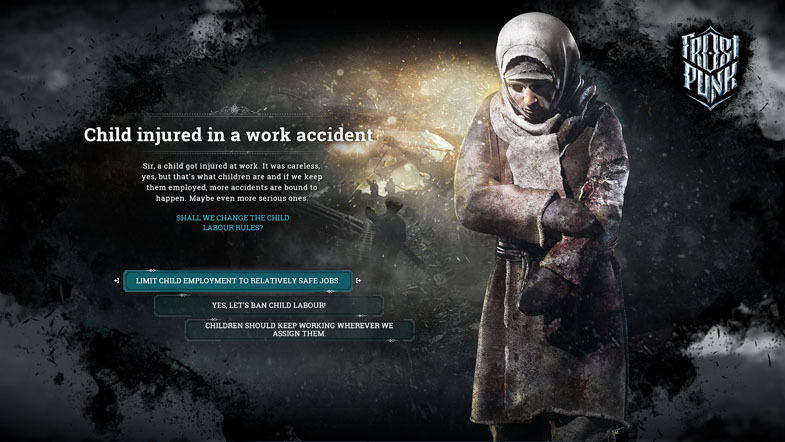 Frostpunk shines a light on these points in the best way any game can; through its gameplay. "What makes you a good leader? Or to put it differently - what makes you an effective leader? Whether you’re a democratically elected leader in some modern country, or if you rule a city in a video game about the last bits of civilization trying to survive on a frozen Earth, the rules stay the same", says Aleksander Kauch, lead gameplay programmer of Frostpunk. "You can try to be the noble one and listen to the people, no matter if they're right or wrong, or you can believe that your cold-blooded calculations will prove valid over the course of survival. Maybe instituting a Neighborhood Watch can keep the unruly streets safe at night... unless you deem it insufficient and decide to send guards to detain rioters with bats instead. From a watchful overseer to the rigorous visionary that puts the higher cause over decency - that will be your choice as a player." Frostpunk will launch at $29.99 USD (29.99 EUR) on Steam, GOG, Humble Store, and others at launch. In a frozen world, people develop steam-powered technology to oppose the cold. You play the ruler, managing both the inhabitants and the infrastructure. What decisions will you make so that society can survive? What will you do when pushed to the limits? Who will you become in the process?